Maryam Rajavi was born in 1953 to a middle class family in Tehran and is married to Massoud Rajavi. She has a daughter (born in 1982) and a degree in metallurgical engineering. 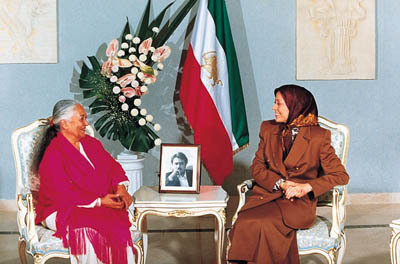 Mrs. Rajavi became acquainted with the anti-shah movement in 1970. 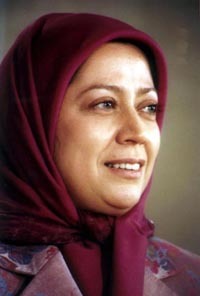 After entering Sharif University of Technology in Tehran to pursue her education, she quickly became a leader of the student movement and joined the People’s Mojahedin of Iran, the Muslim, democratic and nationalist movement that espouses the establishment of a secular government in Iran. The shah’s regime executed one of her sisters, Narges, and the Khomeini regime murdered another, Massoumeh, who was pregnant at the time, along with the sister’s husband. She subsequently resigned from her posts in the Mojahedin and the NLA to devote her entire time to her new responsibility. Shortly afterwards, Mrs. Rajavi went to Paris to lead the Resistance's endeavors on the international scene. Mrs. Rajavi says: "I have dedicated my life to a better future for the people of Iran. I want to prove that as a democratic alternative for society, Islam is not aggressive and can be quite constructive for women. This sense of responsibility gives me inner calm and the feeling of genuine freedom... After the mullahs are overthrown, we must try, before all else, to eliminate the sense of vengeance and hatred among our people. We must create unity and expand the notion of tolerance in society. It is our responsibility to revive the Iranian people's identity and values." 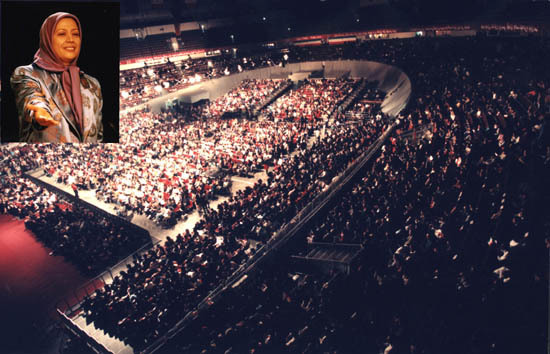 In summer 1994, Marzieh, the grande dame of Iranian music for the last 50 years, left Iran after 15 years of silence in defiance to the mullahs and came to meet Maryam Rajavi and join the ranks of the Resistance. She became a member of the National Council of Resistance and was appointed as the Cultural Advisor to the President-elect. In article 6 of the platform, Mrs. Rajavi reaffirmed women’s equal political, social, cultural and economic rights with men. She also underscored women's rights to choose and get elected, their complete freedom to choose any occupation or government post, including judgeship and presidency, the right to choose their husbands, equal rights in divorce and freedom in choosing their clothing. Tehran-inspired Islamic fundamentalism is the greatest threat to world peace and stability. The International community has more than just a moral responsibility to boycott this medieval regime, she said. Greater delay would have dire consequences. Mrs. Rajavi says that one cannot fight fundamentalism with an anti-Islamic culture. The only way to confront it is to offer a modern and lenient Islam. In promoting this interpretation of Islam, the Iranian Resistance has presented a modern and tolerant visage of Islam and rejected the mullahs' savagery cloaked in religion. With this message, a new international awareness on this issue was evoked by Mrs. Rajavi. In her meetings with international dignitaries, politicians, academicians, parliamentarians and journalists from Europe and the U.S., Mrs. Rajavi underscored this reality, launching an international campaign against the mullahs. 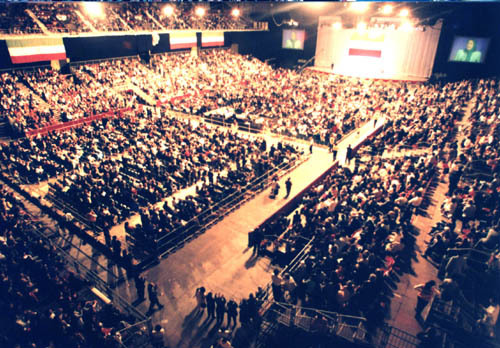 London's Earls Court was the scene of the biggest-ever gathering of Iranians on June 20, 1996, as 25,000 people had gathered to listen to Mrs. Rajavi's speech, titled "Women, voice of the oppressed." She said: "These reactionaries who suppress the Iranian people, especially women, and export terrorism and fundamentalism under the cloak of religion, have nothing to do with Islam. They are peddlers of religion and exploit the name of Islam to advance their sinister, inhuman objectives. Islam is the religion of peace, freedom, liberty, equality, love, mercy and liberation. The mullahs' fundamentalist mindset, however, rests upon vengeance, enmity and ignorance and is at war with human values and world peace. 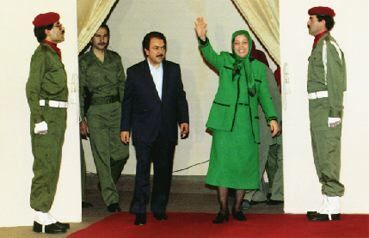 In his return from France, Mrs. Rajavi addressed some 15,000 NLA combatants along Iran-Iraq frontier in 1998. She said: "It was this very Resistance which forced Khomeini to drink the chalice of poison of the cease-fire. And it is this Resistance which has forced the regime to drink the chalice of poison on the political arena, through its political and military struggle and its all-out domestic international endeavors. By relying on the NLA, this Resistance is well on its way to uproot the mullahs' regime." "The council has democratically elected a capable leader, a Muslim, Mojahed woman as an answer to Islamic fundamentalism." "Members of this institution have now spoken in support of the recognition of the National Council of Resistance and in particular, Mrs. Rajavi's leadership." "The National Council of Resistance and its President-elect, Mrs. Maryam Rajavi, have turned a new page in Iran's history. It is therefore necessary that this council and Mrs. Rajavi's presidency be supported internationally." "In my 30 years as a foreign correspondent, I have interviewed many "unusual" leaders -- but I do believe I have finally found the most stunningly unusual one. Her name is Maryam Rajavi; she has been elected the "future president of Iran" by the growing Iranian Resistance, and she is driving the women-hating mullahs of Iran crazy! "As eloquent as she can be regarding freedom for Iranians -- and particularly freedom for women -- it soon becomes clear that this cultured 41-year-old woman is a figure to be watched... It is also Maryam Rajavi who is rapidly becoming the Rorschah blot of hope into which the long-suffering modern and liberal Iranians can read all kinds of hope... Meanwhile, she is becoming the symbol of something new -- the modest but active Islamic women." "Her presence here [in London] has been noted by the Independent and the Times, which had previously included her in the list of the 100 most powerful women in the world... 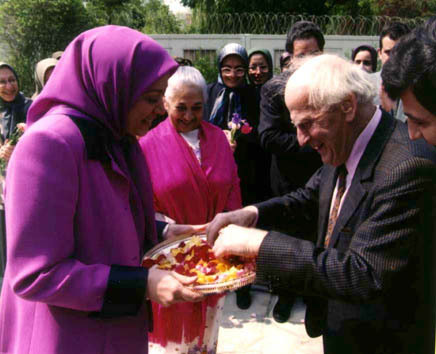 But nobody who has met Mrs. Rajavi and listened to her can possibly doubt that she reached the top because of her own qualities of leadership and her own commitment to the causes of democracy and human rights." "She is charismatic and has very interesting views about how Islam as a religion can be democratic in society, that there is no contradiction between Islam and democracy and human values." "Her message is the message of future and her revolution is victorious. The zenith of our dreams embodies itself in Maryam Rajavi. I believe with her help, we will soon achieve victory. This revolution will soon triumph and change the course of history." "Maryam's impressive compassion and historic character bespeak of a woman totally different from famous women of our history. In her political work for the future of Iran, she can do things which Norwegian women can only dream about. Her character and her call for freedom is indicative of an Islam based on love of humanity and light years away from a terrorist interpretation of the mullahs about Islam. Maryam Rajavi can be compared to such leaders as Abraham Lincoln, Mahatma Gandhi, and Nelson Mandela. She is also a great religious reformer, doing with Islam, what Martin Luther did with Catholicism. Maryam Rajavi can change history."